Various specialty equipment is often required to facilitate commercial window cleaning; such as this light weight 85 ft aerial lift that can fit through double doors to access atrium and other high glass from the inside and not damage the floor and flooring. Sometimes we feel like some Architects lie awake nights dreaming up beautiful windows that can’t be cleaned; and it is our job to safely clean them. Certain historic office buildings require unique safety equipment to perform the job. 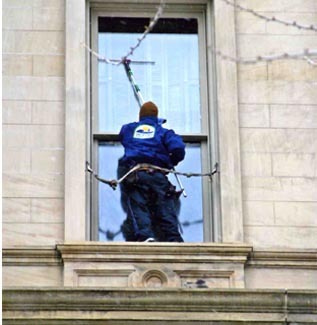 We are trained, certified, equipped and experienced in the performance of Belt Window Cleaning on commercial buildings, in accordance MIOSHA and the ANSI IWCA I-14 Window Cleaning Standard. One of the safest and most versatile pieces of equipment are controlled descent devices. Compared with a portable swing stage; controlled descent procedures offer numerous safety and cost saving advantages when in the hands of properly trained and experienced technicians. Sometimes Commercial Window Cleaning calls for heavier equipment such as our portable swing stage.. Our team has successfully completed the Scaffold and Access Industry Association’s Safety Training for Suspended Scaffolding Program. Our equipment, training and experience protects you and your building as well as our window cleaning technicians. 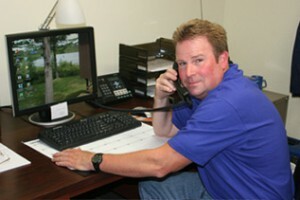 Great Lakes Window Cleaning was the first to bring pure water & waterfed pole technology to Michigan in the 1990’s. This technology uses ultra purified water, in combination with specially designed brushes and high-modulus carbon fiber poles to offer spot-free cleaning of glass and sills. In suitable situations this method provides extraordinary results while moderating the need and risks of ladders, etc. 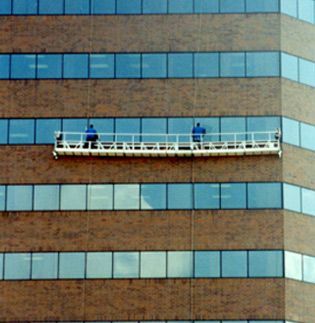 Ladders are still used every day by our commercial window cleaning companies. Each ladder we use is equipped with ladder levelers to use on uneven ground or on stairs. Safety is always our concern. 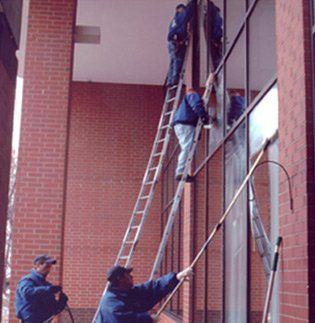 We have specialty ladders including the traditional window cleaning sectional ladders to provide whatever solution is best to access the window to clean it in the best, safest and most efficient manner. All of our technicians receive both written and hands on safety training on the safe use of ladders. We are up for the challenge of cleaning any window, anywhere in any season. We are only limited by our creativity and imagination and of course OSHA regulations and the I-14 ANSI IWCA Window Cleaning Safety Standard. So if it can be done safely and creatively we are on it. We network with leading commercial window cleaning companies all over the United States to find the most safe and cost effective solutions to all of your facility’s window cleaning requirements. The sky is the limit. 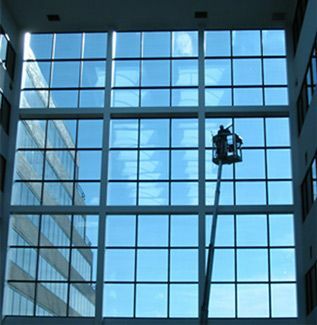 Our Commercial and HighRise window cleaning Service is available in Lansing, Jackson, Flint, Saginaw, Midland Mt. 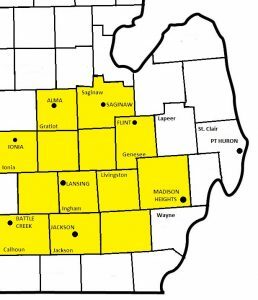 Pleasant, Ann Arbor and throughout Michigan. We are competitively priced yet offer a superior working relationship. 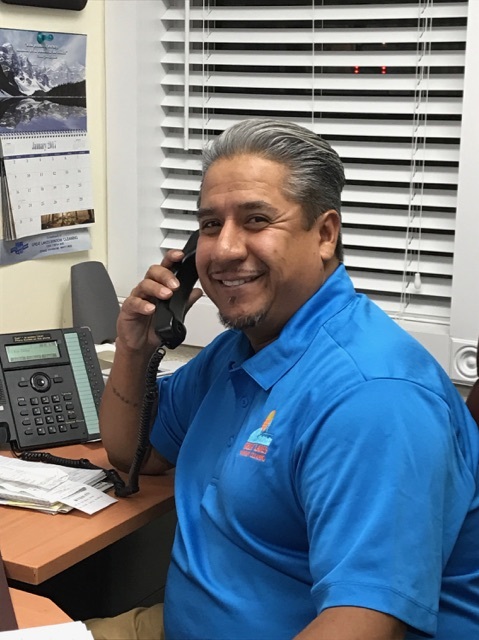 Our technicians work courteously, neatly and with respect for their surroundings and your tenants. Our goal is not only for you to enjoy the cleanest most sparkling windows but also to be grief-free and to have little disturbance to your day. We are fully insured and carry a $1,000,000 Liability Policy. Each technician is bonded and covered by worker’s compensation. We never use “pseudo employees” labeling them as subcontractors to avoid paying workman’s compensation or other insurance. 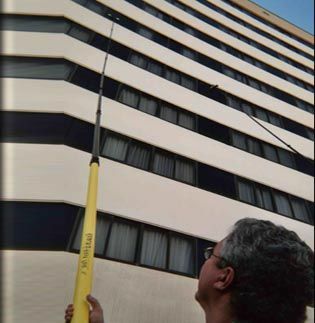 Each member of our highrise commercial window cleaning team has over 10 years experience. 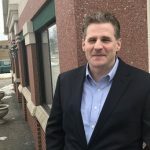 Starting in 1989 as founding members and directors of the International Window Cleaning Association Great Lakes Window Cleaning has participated in promoting safe working standards. 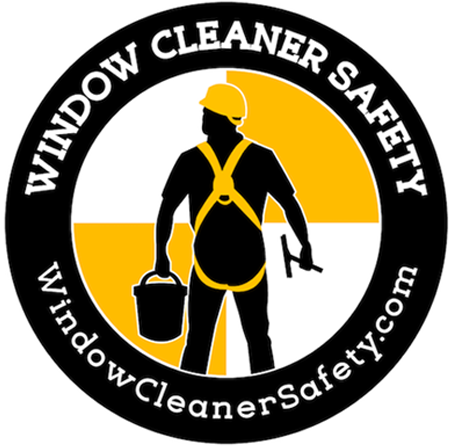 We support and adhere to the ANSI/IWCA I-14 the industry standard for safe window cleaning. Are we competitively priced? Yes. We are competitively priced, but we never try to be the cheapest. You may have heard the expression; “you can have service, quality or price; pick two“. Certainly, with window cleaning companies, “cheap can be expensive.” You don’t want the publicity of your building on the front page of the newspaper with a tragic window cleaning accident. We are efficient, but never too quick to forget to do it safe. Although safe is sometimes expensive, we would rather be slightly more expensive then skip steps and take risks. 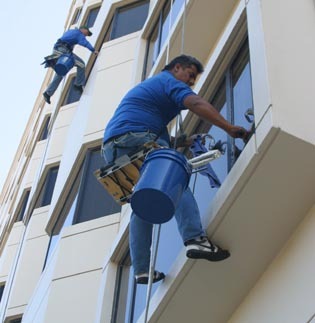 We are trained, equipped and experienced to provide commercial window cleaning service to the leading property management companies and building owners. Our technicians are experienced working in professional office environments and can be counted on to quietly and unobtrusively take care of your tenant’s window cleaning needs with little disturbance to their business. First impressions are the longest lasting: wouldn’t you agree? What impression are your customers getting from the condition of your windows? (or from the appearance and behavior of your window cleaners?) More often than not a customer will form an opinion regarding what they can expect in your store before they even enter the door. Retail business owners often spend a great deal of time designing their storefront to project an image that attracts business; Are your windows attracting? It is our goal to set a schedule for you that keeps your business looking fresh, clean and inviting! If you have a business for which a clean image is critical (restaurants, medical, financial professional, etc) we have programs to keep your windows looking clean BEFORE your image has a chance to be negatively impacted. 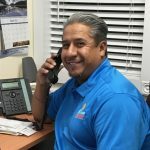 Our retail and commercial window cleaning schedules are computer routed and kept like clockwork. You can count on us to be there summer and winter, rain, snow or shine! 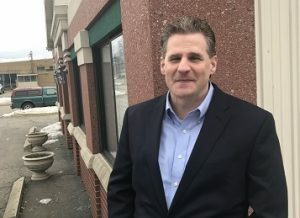 Why does Mid-Michigan choose Great Lakes Window Cleaning to clean Millions of windows annually? RELIABLE – For over 35 years, 52 weeks a year we have been cleaning windows on time and on schedule. Our computer scheduling works like clockwork to give you constant, reliable service 12-months a year. Take window cleaning off your to-do list. 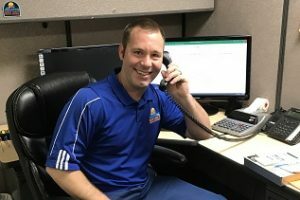 One call = Always clean windows! PROFESSIONAL AND COURTEOUS – Our window cleaning technicians are long term employees who take pride in their work and care about their valued customers and our customer’s customers. 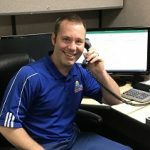 EFFICIENT AND HELPFUL OFFICE STAFF – We have a strong office support staff; a real person to talk to if you have an emergency cleaning, want an estimate or have a question about your bill. LIABILITY INSURANCE – We hope you never need it, but you have the security of our $1,000,000 liability policy. WORKMAN’S COMPENSATION – All employees are covered by Workers Compensation Insurance. WARNING: Only employees are eligible for workers compensation. One or two man small unincorporated companies are not eligible. You and your company may be exposed to lawsuits due to injury on the job. Also BEWARE: some “insured” companies may “sub-contract” to uninsured Employees, a practice we feel is unethical and likely illegal. James performed a great cleaning job. He is prompt, quick, and dedicated to the job even though it was 5 degrees outside. There is no way to improve your service because you can’t improve perfection. Stew was fabulous! He is so thorough. He is very impressive. Andy does such a great job. He is quick but he does not skip quality. Thanks! Company is local, friendly staff. Maceo did an excellent job. 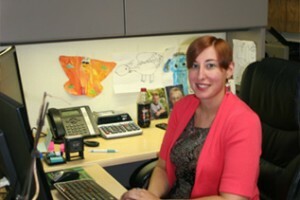 Very knowledgeable & professional. Always can count on on-time, fast, professional, courteous & friendly every time. Thank you!